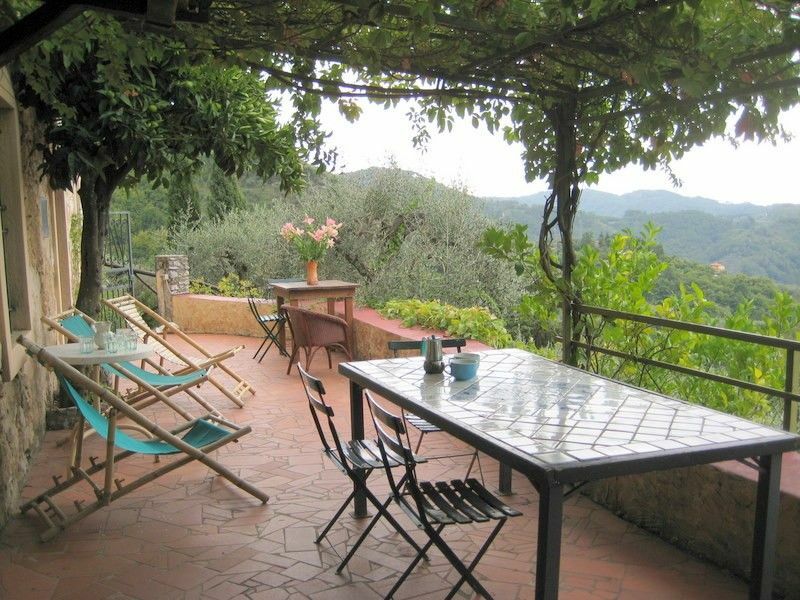 This lovely old Tuscan house is surrounded by terraces of olive groves and sits, on the hillside, just above the beautiful, medieval hamlet of Peralta which was uniquely restored by an international sculptor. (Her sculptures can be seen throughout the hamlet). The view from the house and its large terrace is stunning. You look over the roof tops of Peralta and the valley below towards the hills, and the sea that lies beyond them. Facing south, and with this panoramic view, you can bask in the sun or read and snooze in the shade. The dining table on the terrace is covered by a vine, offering welcome shade. The house has three floors - the 4 bedrooms are spacious and comfortable, all with views. Two bedrooms (first floor) have ensuite bathrooms and the two bedrooms on the top floor share a bathroom. The ground floor comprises a large kitchen with dining area, comfortable living room, a second living room, a washroom.The swimming pool (shared) lies on a terrace above the house. In the photo of the hamlet below, Casa Luigi is the house situated at top of photo. A calm, away from it all, very unique and inspiring location yet within easy reach of the coast, Lucca, Florence, Cinque Terre, etc. A haven of peace where one is delighted to return after a day’s sightseeing. The hamlet of Peralta: The beautiful peaceful hamlet of Peralta has a spectacular setting in the Tuscan hills that rise high above the valley of Camaiore. It was restored with great love and imagination by international sculptor Fiore de Henriquez. She created a place that is quite unique. Peralta was her home up to her death in June 2004 and one can see her work all through the hamlet. Her sculpture everywhere and the manner in which she restored and designed the hamlet give it very special atmosphere and character. With stunning, panoramic views over the valley to the hills and sea beyond and surrounded by terraces of olive groves, its stone walls covered with purple bougainvilleas, lemon trees, jasmine, Peralta seems like paradise, a place for people seeking tranquility and beauty. . The large terrace in front of Peralta is a lovely place to sit with a glass of wine, enjoy the sunsets and meet other guests. Surrounding area: Lovely walking country with marked trails through the olive groves and hills dense with chestnut trees and known for their wild flowers in spring and autumn. Walks range from 50 minutes to a delightful restaurant in an adjoining village, to three hours up to the peak of the Mount Prana above Peralta. In the daytime, there is always someone at hand in the hamlet to help with any questions, give directions to places of interest, lend a map, deal with minor repairs, collect luggage with our tri-porter vehicle (Ape), etc. International sculptor Fiore de Henriquez was living in the area of Camaiore from the 1960's due to its proximity to the Carrara marble quarries and the bronze foundries of nearby Pietrasanta. In the 1970's she found the small hamlet of Peralta, perched on the hillside above Camaiore. It was remote, served only by a footpath, and the buildings were mainly in ruins - their inhabitants having left in the mid 1950's due to the hard living in the hills. No water nor electricity at this time. Fiore fell in love with the hamlet and managed to gradually buy the various houses. She then set about restoring them and the hamlet and created the very unique place that exists today. She died in 2004 and the hamlet was then taken over by a very good friend of her's who is the current owner. . Repairs and renovations are undertaken where necessary, but the essential essence of the hamlet remains the same as when Fiore was alive. It is the home of her archive and sculptures, which can be seen throughout the grounds and in the various accommodation, of which Casa Luigi is one. Abundant supply of hot water in all bathrooms (solar powered with electric backup). Tank of 300 litres so you don't have to worry about hot water running short! The two double bedrooms have ensuite bathrooms. The two twin (or double) bedrooms share a bathroom. The house is set amongst the olive groves that surround the hamlet of Peralta. Shared pool on a terrace above the house with fabulous view over the valley to the sea. An oasis on hot days. The house is on 3 floors: Ground floor: 2 Living rooms, fully equipped kitchen with dishwasher - large refrigerator with separate freezer - gas 4 burner hob and oven - dining area at end of kitchen. Wash room with WC, basin, washing machine. First floor: 2 double bedrooms with en suite shower rooms, WC. Second floor: 2 twin bedded rooms sharing a shower room, WC. All rooms have views over the valley towards the sea. Large terrace with wonderful view, table seating up to 10 under shade, deck chairs/sun loungers. We are happy to have children of all ages in July and August, but 10 yrs and over in other months. This rule is because our guests come to Peralta expecting a peaceful, tranquil holiday, and this is not compatible with younger children who naturally want to run, play and make quite a lot of noise especially around the pool. We make an exception during the school holidays. Relaxingly away from it all yet near everything! A relaxed, inspiring atmosphere with a stunning view where you can either keep to yourself or be amongst the fabulous Tuscan world while feeling like you are in Italy proper, not just a tourist. The relaxed but highly organised and knowledgable Kate was available for anything we needed. Our villa, Casa Luigi, had plenty of space, was perfectly clean and had just the right amount of mod cons to be rustic but practical. The teenagers loved the wifi terraces and swimming pool and the sense of satisfaction at completing the beautiful walk up or down to the car, restaurants etc. The beautiful quality and impressive quantity of Fiore de Henrique's works scattered around enhanced the inspiring atmosphere which considering the view was a surprisingly pleasant added joy. The nearest restaurants were equally relaxed and provided delicious local food; our favourite was C'era Una Volta from which they willingly provided us lifts back up to Peralta. Visits to Pisa, Florence, Lucca and the beach at Viareggio were not only highly recommended but also easily manageable. Teenagers and adults got so much from this change from our everyday lives. We hope to be back with the rest of our brood soon! Enjoyed every minute of our holiday here. The house had everything we needed for a family of 5 - including essential wifi down the hill for our 3 teens! The hilltop pool was a real bonus - felt like swimming on top of the world every evening, with the sun going down, turning the sea and sky golden. Kate and Lee were so friendly and helpful when needed for any questions or practical help but also melted into the background and worked away behind the scenes the rest of the time. Peralta is such a fabulous, peaceful hideaway and yet close enough to explore towns and cities - Lucca is a real gem, then of course Pisa and Florence are fabulous too. The lake in the national park is well worth the trip too, especially the boardwalk trail from Massaciuccoli, where we were delighted with 3 new bird species! Eating out was a great experience too, from the corner pizzeria down the hill, to the many and varied options in the cities. Don't forget to try out the amazing ice-cream shops too! The corner shop down the hill stocks all essentials including fresh bread in the mornings and is worth the visit just for the parmesan grating machine and the lovely shopkeeper of endless patience and smiles who clearly appreciates the extra business, even is she has to mime for it! The walk from the car park to the house was an enjoyable addition to our daily routine and on the last day our early start was made all the more pleasant with the addition of a few shooting stars! We hope we will be back! Peralta is a place you'll find it very difficult not to fall in love with - not least the house 'Casa Luigi' we rented and shared with our friends this time. 4 adults, 4 children, plenty of space and a wonderful terrace overlooking the hills and valleys of Tuscany. There's a vibe to Peralta that we haven't found anywhere else. Maybe it's Kate and Dinah and their numerous friends who run the place, maybe it's the art of Flores de Hernandez that meets your eye no matter where you go - or maybe it's the good old concept of trust and headspace. (just leave a note if you borrow a bottle of wine from the bar at the main terrace in this little village)... Ah, the peace and quietness of this place, the fresh air of the mountains, the breathtaking views..I can us all returning year after year, This really is a place like nowhere else. Thank you very much. It was so nice to see you back. See you next year . Peralta has everything that one would expect of a vacation in Tuscany and more. The views of the rolling hills and the misty ocean make you feel as if you have stepped into a painting. The accommodations are charming and the staff is very hospitable. In my opinion, the statues by Fiore de Henriquez, which are dotted throughout the property, make this location unique and unforgettable. One great advantage of the hillside location is that it is a few degrees cooler than the lowland which is wonderful at the end of a hot day sightseeing. Peralta is a magical and peaceful vacation destination. I celebrated my 60th birthday at Casa Luigi with 5 girlfriends and I would recommend this lovely villa to anybody who appreciates the natural beauty of Tuscany. The weather was perfect, Dinah, the owner, Kate the Manager and Stephen the Go to Guy were very accommodating and gave us lots of tips and recommendations for making this trip memorable and one we will all never forget. As previous reviewers mentioned it is not the easiest place to get to but you will be glad of that once you get there. Peralta is a little piece of heaven that you don't need to share with a lot of people, It is like having your own Holiday Home. We had several meals prepared by Laura which were as good as any meal we had at a local restaurant. The view from Casa Luigi is magical and to wake up to it every morning and to go sleep to it every night will remain a memory we will never forget. We were close to the ocean, mountains and had fabulous shopping in Lucca, Florence, Forti Dei Marmi, and Portevenero as well as seeing the leaning Tower of Pisa and the amazing museums in Florence. We stayed for 2 weeks but could have stayed for a month and still not have seen everything on our list of things to do. I cannot finish this review without mentioning Ellie the resident dog. I am a dog lover and have 3 dogs and by having Ellie around made this trip extra special. She is a wonderful mascot for Peralta and will welcome you to her home with a twinkle in her eye and a tennis ball in her mouth ready for a game of fetch! We stayed in several places as part of our Honeymoon across France and Italy. The moment we stepped foot in Peralta, we felt instantly more relaxed than any other place we had been. It is laid out across a hillside and each little home you can stay in are beautifully decorated. There is a pool at the top of Peralta which has one of the best views I've ever seen. We could have sat up there reading books all day. It was in the mid thirties when we were there but the breeze keeps you perfectly cool. We basically don't have a single complaint about the place. You really just have to go there to understand. It has a blend of italian artistry and rustic comfort. We wouldn't hesitate to go back. The owner Dina, is a wonderful character and all her staff are very welcoming. Peralta is one of those very special places that is off the beaten track of a normal holiday destination and the perfect place to either do nothing or use as a base to explore the wonderful region of Tuscany. We ask for a damage deposit when you arrive at the house. This should be made in cash and will be returned when you leave, providing the house is in good order.